If you have been a reader of 26.2 Quest for very long or have spent any time browsing around you will find that Family Running is something that is definitely something that is a big part of both my running life as well as everyday life. With that in mind it is no surprise that when I found Partnerunning and their book Couple On The Run about running 8 marathons in 8 countries in 8 weeks, I was immediately drawn in and intrigued. I don't remember where I found them first, whether it was on Facebook at their Partnerunning Fanpage, their Couple On The Run Fanpage, or if it was on Twitter at either @partnerunning or @coupleontherun, but once I found them it was quick and easy to build a relationship with them through social media. It is amazing what social media has done to dry up the oceans in a figurative way to allow relationships to be built regardless of what continent you call home. Over the next 24 hours, starting at 1:00 pm est they will be doing an Ultimate Online Marathon, a 24 hour virtual launch of their Couple On The Run book. This virtual launch will consist of a whirlwind of social media as well as video interviews (which I am proud to be a part of!) and Ustream activities. There will be plenty of chances to win some great prizes, and time to interact with both Andrew and Sue as the activities continue throughout the 24 hour launch. One very cool part of the virtual launch will be the Race Around The World, a virtual scavenger hunt, with some great prizes to be won. So, before you forget, head on out and follow @partnerunning and @coupleontherun on Twitter, and make sure you "Like" both Couple On The Run and Partnerunning on Facebook. While you are on Twitter set up a search and start watching the #couplerun hashtag for all of the launch events on Twitter. So, you have spent some time looking around and getting ready to follow the virtual launch, but you want to know how you can get your hands on the Couple On The Run book? 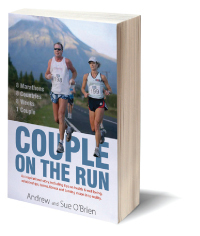 You can head over to www.coupleontherun.com and find links to Amazon where you can buy both the actual book or a Kindle version of the book. That is right, I am privileged to be part of the video interviews, but I also will be giving you a chance to win a copy of the book as well. There are many ways to get easy entries to add to your chances, but make sure you do the first and required entry first. This giveaway will last till Saturday, February 19th . I wanted to make it last for 24 hours like the launch but since much of the United States won't be reading this till Monday morning it will not give them much of a chance to read, enter, and spread the word. Check out the Couple On The Run website www.coupleontherun.com. Stop back by and let us know something quick that you learned. "Like" the Couple On The Run Fanpage. "Like" the 26.2 Quest Fanpage. "Like" the Family Running Fanpage. ***Once you have done each of the above make sure you leave a comment here on the blog for each entry telling me what you have done. Wow. Didn't realize they had to overcome Chronic Fatigue Syndrome. I already follow them on the Twitters. Posted it in my sidebar on Mom vs. Marathon. Now following partnerrunning on Twitter. They sound really inspirational!